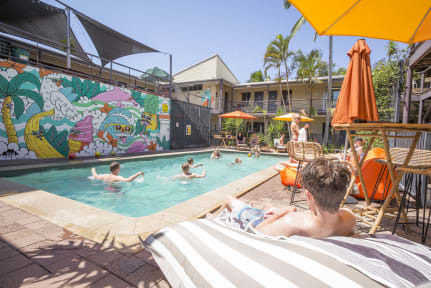 Byron Bay YHA is located right in the centre of this popular seaside town and only metres to some of Australia's top surf beaches. It is Byron's newest hostel with a contemporary chilled extension and new communal areas opened in early 2018. Enjoy the new large kitchen, extra outdoor decks and seating area, and comfy lounge. The contemporary design includes a new reception, lush tropical gardens and pool area, and eye-catching outdoor artwork. You have a great choice of accommodation. Choose from backpacker rooms with shared bathrooms, lockers and fans, or ensuite multi-share rooms with air conditioning. There is also a range of private rooms too - all ensuite with AC and flat screen TVs - in the new wing. Hire a surfboard, bike or free bodyboard from the hostel and check out Byron Bay's unspoilt beaches and great cycling trails or watch the sun set over Australia's eastern-most point. If that's not enough, there is snorkelling, kayaking, hang-gliding, rainforest tours, whale watching, and a busy nightlife scene.